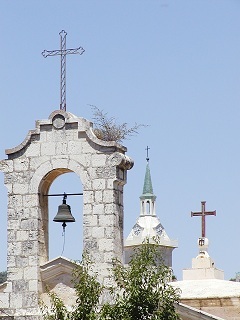 Ein Karem (literally “Spring of the Vineyard”) is an ancient village, and now a suburb of Jerusalem. John the Baptist is believed to have been born there, and that is the reason for the many churches and monasteries around the village. The photograph, taken by my other half, shows… I’m not quite sure what. The steeple in the middle looks as if it belongs to the Church of St John the Baptist. The others…. I’d better go there again soon. Commenters: the comment button is at the top of the post. I’m probably wrong, but is that where there is this really, really old bush, that many people believe could be the burning bush Moses saw? Saw it in a documentary once. I don’t know – I hadn’t heard of that.